Strength is quiet. It’s dealing calmly with frustrations when what you really want to do is lash out. It’s molding situations over time, knowing that you can endure. It’s love and forgiveness. This card can serve as compassionate reminder not to give up although your circumstances may seem wild and out of control. After the Fool meets the Chariot and hears the message of power through self-direction, they go forward in their journey with absolute, uncompromising victory in mind. Eventually the Fool grows tired of the fire in their belly. That’s when the Fool finds Strength. Pure, innocent, yet firmly grounded, Strength shows us the calmer side of power. While card 7 represents strength directed outwards, Strength is about the power of the inner spirit to influence and overcome anything. Strength reminds us that we are both animal and divine. While our aggressive animal side is full of potential, it takes a higher level of consciousness to master. 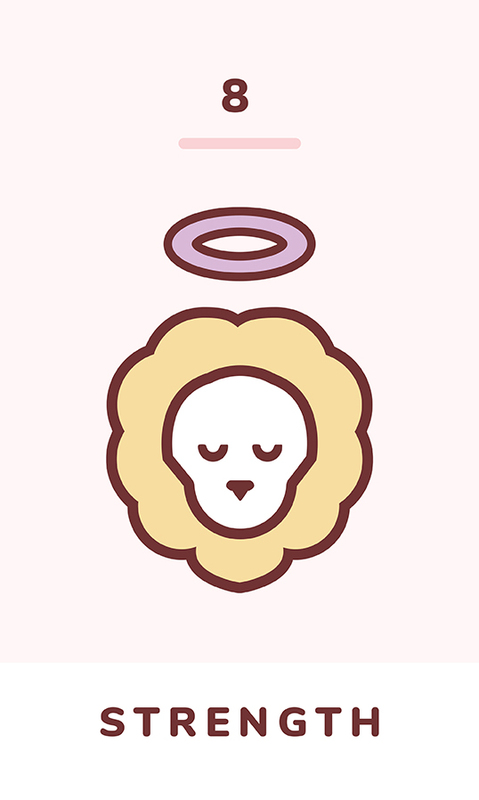 Represented by a tame lion, Strength is about honoring and mastering animal nature through warmth and gentleness. Although what fear may seem unruly and uncontrollable, that’s really what makes it powerless. Receiving Strength in a reading is a sign that even though you may feel your situation is unwieldy, you are the one in control. Whether you are trying to tame a situation or force, remember to give more gentleness than you receive, or else you will never get anywhere new. Strength reversed signifies weakness. You may be doubting your own journey and feeling vulnerable. Remember that you do have inner strength to call upon. Reconnect with the Chariot’s lesson of self-confidence to feel balance. In love readings, Strength reversed be a positive sign that love is going well though it may be imbalanced. Are you overestimating the strength of the love you’re receiving? Maybe it’s time to reflect on why. Be careful, and don’t push for something that doesn’t come naturally to the other person. The message of Strength is patience and tolerance. This card reversed can also mean that aggression is an issue for you. You need to take steps to learn how to control your raw emotions or you will hurt someone you love.